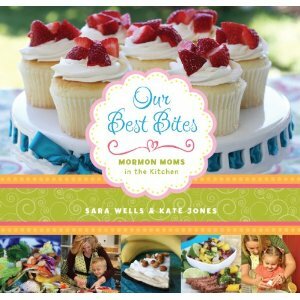 House 344: Where We Learned to Live, Love, and Cook: Friday Favorites and...A GIVEAWAY!!! Happy Friday! This week I wanted to introduce those who haven't heard of it, to Bountiful Baskets. It is such an amazing program, and it really helps me and my family to eat healthier. WHAT?! You thought all we ate was cupcakes and creamy pasta?! ;o) I wish! So...Bountiful Baskets comes to our little town every other week. I get so excited when I go pick it up, because you never know what you are gonna get. But it is always yummy and you have the option to add other things to your basket each time. I always get the 5 pack of 9 grain bread. Not only is it yummy, but it's healthy and it's only 3 points for 2 slices on Weight Watchers! AWESOME! Anyhoo...You do have to pay a little extra the first time you sign up, but after that it's only $16.50 for a basket. A good price for how many fruits and veggies you get. Seriously...It's quite a bit, and i'm pretty sure it'd cost me an arm and a leg to get all that produce at my local grocery store. So, go check out their website and see if you can get one in your town or close by. You need to order quickly because they go so fast. You can only order Monday-Tuesday. Go HERE to check it out. I'm sure you will love it as much as I do. 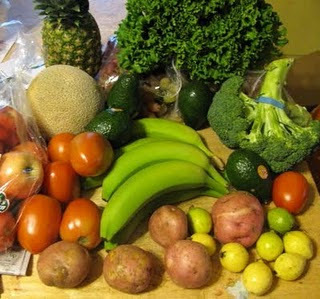 Here's a pic of what came in a basket...it's a lot of produce! I'm so excited about it! I can't wait to get mine...yes...I've already pre-ordered it. I want one of you to have one too! So...each of you can have 3 entries if you do these 3 things and make sure TO LEAVE A COMMENT FOR EACH THING YOU DO. :o) First thing-You MUST be a follower on our blog, and let us know how we are doing and what you'd like to see more of on our blog. Second thing-'Like' us on facebook, and post this fun giveaway on your wall. ﻿And Third Thing-If one of your friends follow, make sure they let us know and we'll give you and them another entry. YAY! Good luck and winner will be announced next Friday! I'm a follwer! I love your site and I don't want to tell you more of what I want to see, because I like to be surprised! You guys are doing great! I don't know how I wasn't a follower (weird) but now I am!! Love it all.. I am a blog follower!!!! My sister showed me your blog. I referred my Sis to your site and now she's a follower. She's young but she's going to be the next Betty Crocker I swear it. She's into the cooking thing too! I'm a new follower yay! Amber (right above me) referred me! Thanks Amber! Well I guess I am an official follower! Love your recipes! I like you on FB 2! I'm a fellow stalker. I'd like to see more food shared with me that I didn't have to cook. Hint hint... Just kidding. I've enjoyed all of your ideas. I also stalk I mean like you on Facebook. My cousin Tansy referred me to your blog! Love it! Thanks for the great recipes that I can pass on! I am a follower and I think you are doing a fabulous job. I just recently made your Death by Chocolate Brownies, they are SO GOOD. So easy to make and I seriously suggest everyone needs to make these and enjoy. I can't wait to make them again. Thanks Monica and Erica, I am glad that you are sticking with it. I am a follower. I really like what you are doing now. Don't need to change a thing. I like you on facebook and put it on my wall as well!